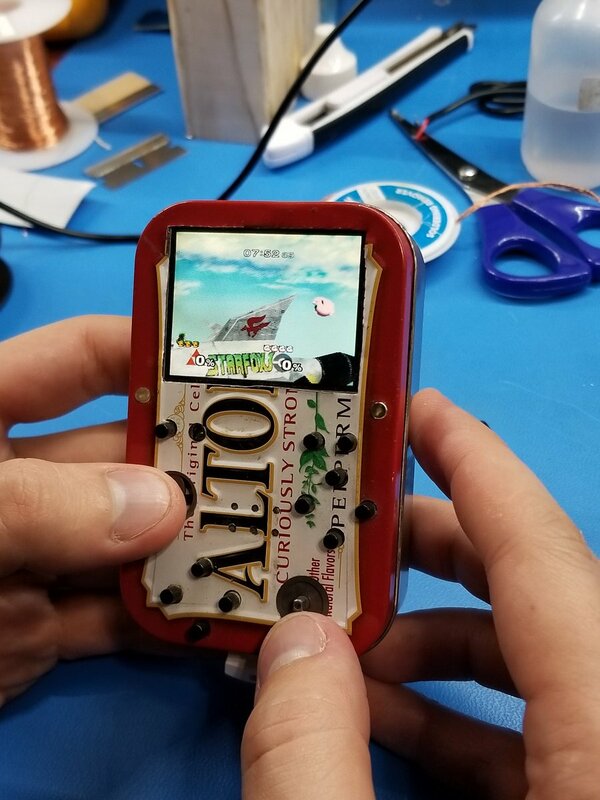 Human innovation has breached a brave new frontier after a student turned a tin of mints into a working, portable Nintendo Wii. Aden Shank, 23, fitted the circuitry of the games console inside a tin of Altoids and added controls and a display to its front. The remarkable creation can play any Wii game and even wirelessly connect Wii remotes should you wish to use one of the console’s motion-sensor-controlled games – but Aden wouldn’t recommend it as a practical outlet for gamers. Nope. Charge for 3 hours, play for 10 minutes. Lovingly nicknamed the KillMii, the portable device has a short battery life, difficult controls and struggles with overheating, but Aden made it to prove it could be done rather than practical use. Turning games consoles into portables is Aden’s hobby and one he shares with many on online communities. “When I started making portables about four years ago, there was no documentation on the Wii, and I knew nothing about electronics,” said Aden. Many of Aden’s fellow hobbyists helped in the device’s creation, such as Aurelio Mannara, who built the device’s miniature control pad. It’s such a satisfying hobby with a great community,” said Aden. “I’d like to give a thanks to Gman for helping me finish it, as well as Aurelio, ShockSlayer, and the BitBuilt community for all their support along the way. “The Bitbuilt community spent years reverse engineering the Wii in order for us to trim down the motherboard and rewire many of the parts, as well as writing software to allow it to work without some components. Aden posted a video of the KillMii in action on his YouTube channel, which you can watch below. So, next time you go to throw away an empty tin of mints, just remember the potential it holds.